I can feel it happening. It’s that feeling when something starts to slip from your hands. You try to squeeze tighter, and with all your might force your fingers closed. Yet you can still feel the coolness, the warmth, slowly leaving your hands. And you know what’s coming. You know the fallout of losing it. So you close your eyes and start to whisper “just hold on” “just…hold…on” Each whisper a hope that your hand can hold tighter….that it’s grip can supernaturally some how hold on. There are just some things in this life we can’t hold onto forever. She was born closer to death then the general population of the world. Just like those who are older and their bodies start to betray them, slowly they shut down and the only next step is to enter their heavenly home, so is my girl. We are having chronic issues with her left lung. It is filling with a fluid and if we don’t stay on top of it, it will collapse that lung again. If we can’t figure out why it is happening, our choices are slim, and the slim ones we have are not good ones to choose from. Our choices look like, lung removal or continue to fight with the lung and count on multiple trips to the ER. Slowly slipping from my fingers. I shouldn’t be surprised. It is what “they” said would happen when we left the first hospital we ever graced the doors of. This would be how she goes. Yet as these past almost 4 years have gone by, we have found a groove, a way of living and it has seemed like we could do it forever. Like my grip has been tight enough to keep her in my hands. Then we had that lung collapse, that is when the real slipping started to happen. When I really felt how much I couldn’t do. 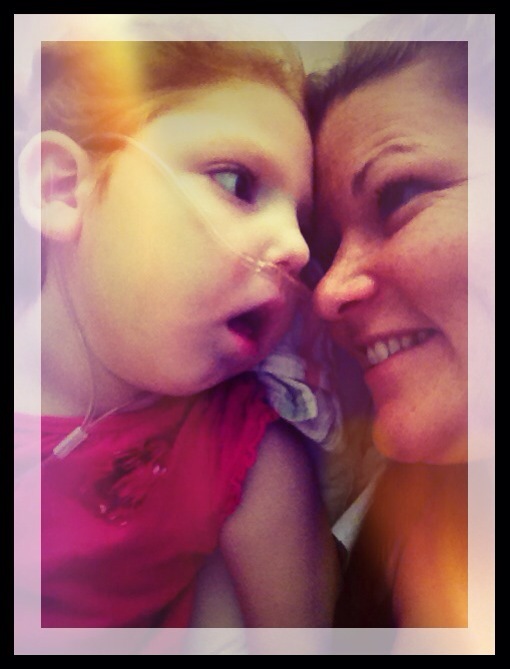 Then there was this hospital stay….four months later. Four months! It’s too short. Katie Grace is telling us what is to come. She is showing us that although she would love to stay….her time here is coming to an end. I need to hear her and what she is saying. Although every ounce of the mom in me is squeezing my hands and whispering words of hope, I know. I know my daughter. She is asking me the only way she knows how…to let her go. She is paving a path for me, to enter on the last part of this journey together but she needs me to let go. To breathe in another source of hope outside of my strength. She needs me to look at what is too come differently. So I say to death, as he peeks his head around every corner of my life with Katie Grace. I see you and I fear you not. I see you and still I know who has conquered you. I release my grip. I choose to let her go. I turn my eyes to my daughter and say “Okay baby what does this time look like? Show me what our last times together should be.” I want our union in heaven to look like laughter and connection over the life we shared….not just the hard thing we survived. Show me daughter…..reveal to me the memories you want to have. For you daughter, I lay down my hope in holding on. As the pieces of me who would hold onto you forever, cry their tears and lay to rest, I chose to place my hope in the One who connects us always and provides a place for us to be always. I look forward to this next month, two months, six months or year. However long we have left with you daughter, I am excited. i’m not going to lie, i saw this pop up in fb way earlier but i wasn’t ready to read it ha! Katie, your strength in knowing when to let go is beyond words. i am so in awe if your strength as you take this journey with KG, Charles, and Issac. Praying that you have greater and amazing connection and memories with KG!! Love you!!!! She is one beautiful girl. Just beauty. As is her mama’s heart. I love reading your heart. Oh Katie, what a process. I so love you. Thank you for the journey, and please know that we so love you, Charles, Katie Grace and Isaac!